When Michael Pollan decided to plant a garden, the result was the acclaimed bestseller Second Nature. In A Place of My Own, he turns his sharp insight to the craft of building, as he recounts the process of designing and constructing a small one-room structure on his rural Connecticut property—a place in which he hoped to read, write, and daydream, built with his own two unhandy hands. 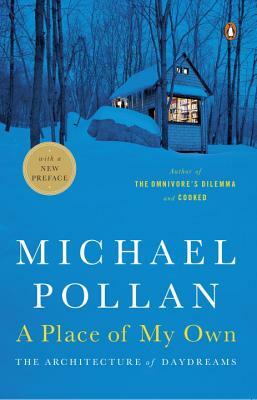 Michael Pollan's unmatched ability to draw lines of connection between our everyday experiences--whether eating, gardening, or building--and the natural world has been the basis for the popular success of his many works of nonfiction, including the genre-defining bestsellers The Omnivore's Dilemma and In Defense of Food. With this updated edition of his earlier book A Place of My Own, readers can revisit the inspired, intelligent, and often hilarious story of Pollan's realization of a room of his own--a small, wooden hut, his "shelter for daydreams"--built with his admittedly unhandy hands. Inspired by both Thoreau and Mr. Blandings, A Place of My Own not only works to convey the history and meaning of all human building, it also marks the connections between our bodies, our minds, and the natural world. Michael Pollan, recently featured on Netflix in the four-part series Cooked, is the author of seven previous books, including Cooked, Food Rules, In Defense of Food, The Omnivore’s Dilemma and The Botany of Desire, all of which were New York Times bestsellers. A longtime contributor to the New York Times Magazine, he also teaches writing at Harvard and the University of California, Berkeley. In 2010, TIME magazine named him one of the one hundred most influential people in the world.